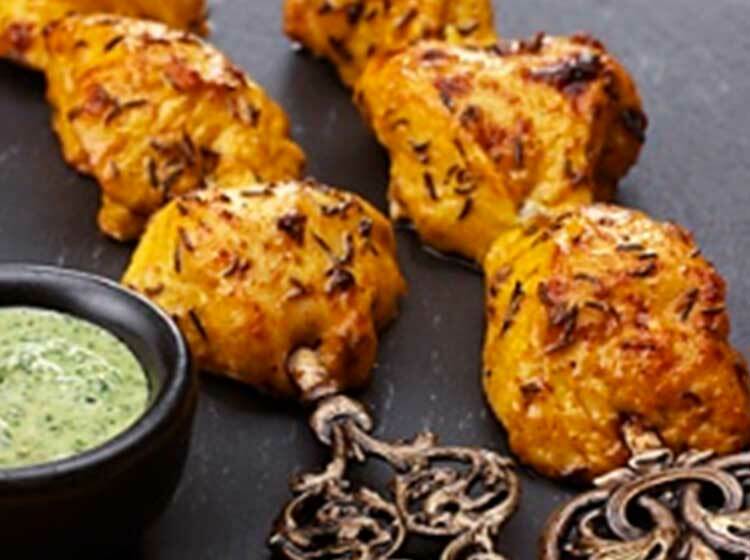 In India, a variety of chicken tikka is cooked all of which have their own distinctive appearance and taste. This version has the warm and assertive taste of cumin. Both Royal cumin and the standard variety are used here. It is known as ‘Shahi Zeera’, but if you cannot get it, just use the standard variety. The yogurt used to marinate the chicken needs to be relatively moisture-free. You can strain plain yogurt through a muslin cloth. Cut the chicken into 2.5cm cubes and place in a mixing bowl and rub the lime juice and salt well into the pieces with your finger tips. Set aside for 30 minutes. Whisk the yogurt and add the remaining ingredients together, except the melted butter. Mix well and add this marinade to the chicken. Mix thoroughly until the chicken is fully coated. Cover and leave to marinate for 2-3 hours or overnight in the fridge. Bring it to room temperature before cooking. Pre-heat the grill to high and line a grill pan with foil. Lightly brush the foil and 5-6 metal skewers with oil. If you are using bamboo skewers soak them for 30 minutes first. This prevents them burning during cooking. Thread the chicken pieces onto the skewers (reserve any remaining marinade) and place them on the prepared grill pan. Cook 7.5cm below the heat source for 5 minutes. Meanwhile, mix the left over marinade with the melted butter and brush the chicken generously with the mixture. Continue to cook for 2-3minutes or until slightly charred. Turn the skewers over and baste with the remaining spiced butter. Cook for 2-3 minute or until charred as above. Remove and serve.